No one should see this. : T Shirt Quilt! So, who doesn't love awesome nerdy t-shirts? I've bought so many of them over the years that I honestly couldn't say how much I've spent on them. I used to follow shirt.woot.com religiously and bought shirts constantly. However I always had a problem with woot shirts being just slightly too short for me. And as time went on and other shirt a day sites surfaced I found other places who's shirts fit me better, and that resulted in my poor woot shirts getting shoved in a drawer and never being worn. But just because I didn't wear them didn't make them less awesome. And it made me really sad that they never got any attention, especially with how many of them I had. 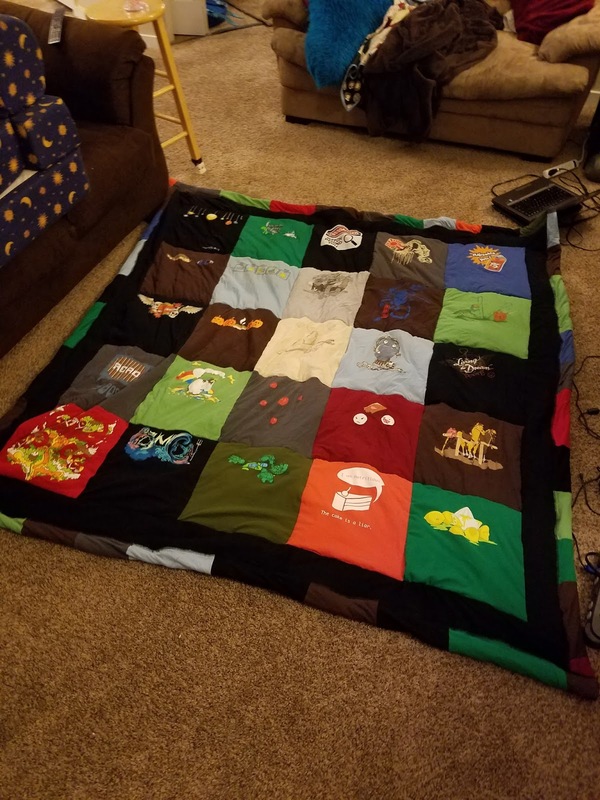 So I decided to turn them into a wonderful cuddly t-shirt quilt. It may be on of the ugliest things I've ever made, and I was not careful on the straightness of the quilting lines, since I don't like quilting. It's so half-assed, but I don't even care. I love it so much. It's soft and snuggly and awesome.